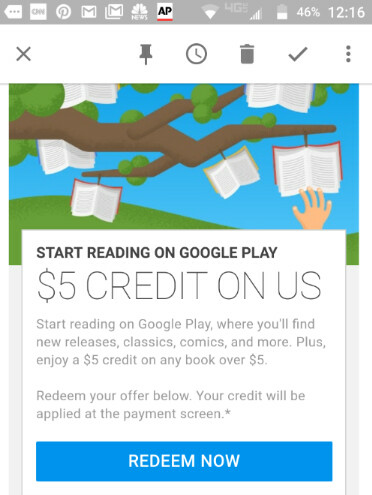 Google is sending out $5 credit coupons to Android users who have yet to purchase a book from Google, and who have opted in to receive the latest deals from Google Play. The coupon is good for use on certain titles. If you figured that you would be able to use the coupon to score a free book, forget it. The coupon can be used only toward eligible titles that cost more than $5. To redeem the coupon, click on the link that reads "Redeem Now." The $5 will be applied at the payment screen. You must redeem the coupon by August 31, 2017, and only one coupon can be redeemed per user. There are many more titles to choose from. Click on the "Redeem Now" link in order to check out all of the books that you can pick from. Can I read it on a kindle? Can export it to EPUB.